(APN) ATLANTA — HB 859, Campus Carry, sponsored by State Rep. Rick Jasperse (R-Jasper), passed the House on February 23, 2016, and had its first Senate Judiciary hearing on Wednesday March 02. HB 859 is yet another model legislative bill pushed by the American Legislative Exchange Council (ALEC), along with the National Rifle Association (NRA) and local gun groups around the county. HB 859 allows for anyone 21 years or older with a weapon license, to carry a concealed gun in a classroom, cafeteria, or library of any public technical school, vocational school, college, or university. Private schools are not covered by this bill. Exemptions are dormitories, fraternities, sorority houses, and athletic events. An exception to the exemption is a person can carry a concealed weapon to a concert on campus. It allows students to carry weapons into a classroom with no instructions or supervision, and the bill does not require any training on how to safely use a gun. State Sen. Vincent Fort (D-Atlanta) questioned Rep. Jasperse on the logistics of where that 21 year old student, without a car, would store his or her weapon after leaving the classroom and before going to the dormitory, or fraternity or sorority house. Rep. Jasperse responded that he put his gun in his car, but never gave a reasoned answer on where a student without a car would store his gun. Over forty people signed up to speak against the bill, while five or six spoke for the bill. College students, professors, faculty, and parents of college students spoke against the bill. 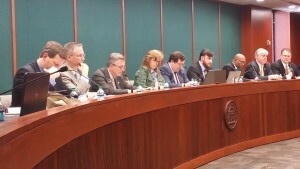 It is unfortunate that State Sen. Bill Cowsert (R-Athens) had to leave so early, and missed hearing from all the presenters who came from the University of Georgia in his district , to oppose the bill. “Students and faculty at our institutions are protected by trained, post-certified police officers… and allowing students to have guns on campus makes their job extremely challenging,” Chancellor Henry Huckaby, Board of Regents, University System of Georgia, told the Committee. Several opponents of HB 859 accused legislators of only listening to the NRA and Georgia Carry a pro-gun lobby. Parents, professors, faculty, and students warned of a “Brain Drain” exodus from Georgia if this bill is passed. Several said they feared being shot by disgruntled students. Other opponents of HB 859 testified that in reality many college students are too impulsive and immature to carry a gun. Other were concerned about increased suicides and the mix of alcohol and guns on campus. Moms Demand Action and Gunsense Georgia pointed out the cost for this unfunded bill would run in the millions of dollars, to pay for additional security equipment, training, insurance, gun lockers, and metal detectors, to keep guns out of restricted areas like sporting events. The State of Florida estimated the total cost to cover those expenses to be 74 million dollars, and that is one reason why they rejected a similar bill. The State of Texas estimated the cost to to be 47 million dollars. The State of Idaho’s cost for increased security was 30.7 million dollars after passing a similar bill. The State of Indiana paid out forty million dollars in damages for injury due to gun laws on public property. From 2001 through 2010, more than twice as many people were killed by guns in Georgia than killed in combat in the U.S. Invasions and Occupations of Iraq and Afghanistan, according to Gunsense Georgia. Georgia’s lax gun laws contribute to the gun pipeline that exports guns from Georgia up north, that are later used in crimes in other U.S. states. Opponents suggest the Georgia Senate should first experiment with allowing guns in their committee meetings and see how that goes, before experimenting with our children in college. The next Senate Judiciary meeting will probably be next week when committee members will vote on HB 859. Stay tuned for the fireworks. Thank you for an honest account of Wednesday’s meeting. Please be there on Monday afternoon to continue hearing from parents and educators on why they oppose this bill. atmosphere on campus. It would create fear of gun violence, and possible intimidation with firearms. It would hinder the free exchange of ideas and learning that are part of the university mission. Please share what you know about date/time of the senate vote. I have a group of faculty and students from UGA and we would be VERY interested in making the trip to Atl tomorrow. Isn’t this wonderful. I can’t wait until kindergartners can carry guns to school. Wouldn’t thsat be as great idea? Wait until next year and we may see a “Guns in Kindergarten” bill. Of course, if a 3 year old has a butter knife he or she can still go to jail but guns are OK.